The Co-op members can vote for which local cause they want to support. 1% of their shop goes to the local cause of choice. Another local cause was Winton Pre-school who will put their £1,600 towards buying an interactive whiteboard and ICT equipment. Salisbury Road Co-op combined their celebration with London Road Co-op. Andover and District Mencap want to send a special thank you to Co-op London Road Andover. They collected £180 extra during the year. 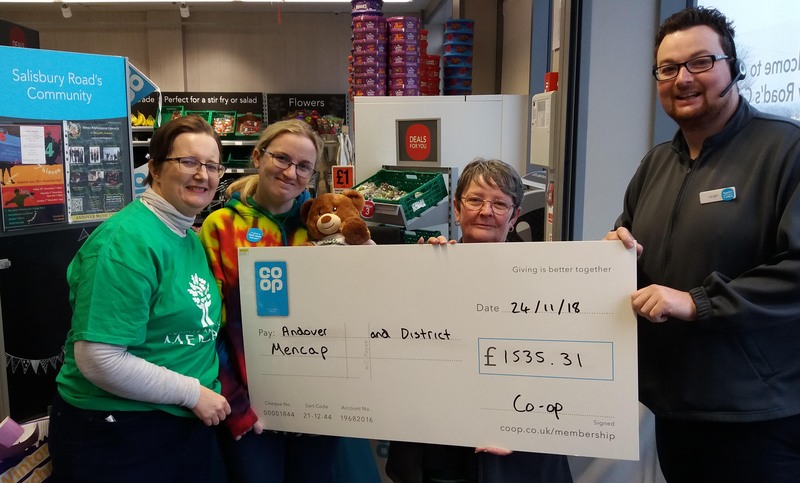 Andover and District Mencap will combine the London Road Co-op donation with the £100 raised by the parents and supporters of the After School Club. The money will go to creating an After School Club outdoor playground. Andover and District Mencap have been chosen for the 2019 year and raising money for landscaping the children's respite care home Rainbow corner.